Welcome back to one last behind the scenes look at Eternity’s Empire to celebrate the release of The Soul of the Earth in paperback! If you missed it, on Monday, I identified when the series abandoned the outline I originally wrote for it, and why that ended up being a good thing. I also spoke a bit about the creation of the second series’ covers. Today I’d like to reveal more of the initial concept art I created using doll makers. But first, a bit about what makes up the core of the series. Points if you guessed relationships. When I unveiled the second and third installations of the Mystical Island trilogy, I talked about how I revisited character development for each of the major characters in order to advance or modify their aspects. 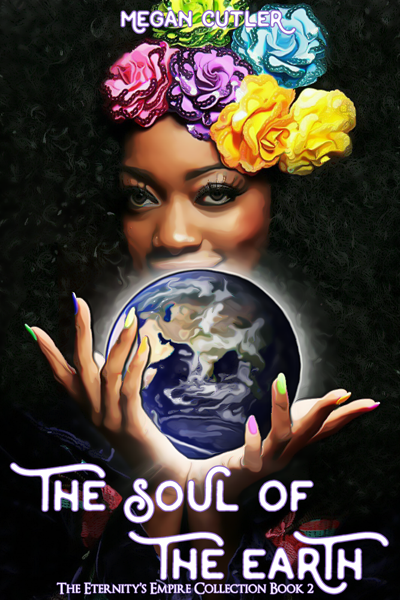 The Soul of the Earth required no such planning since there’s no time jump between the first and second installments. They happen one right after the other. But that doesn’t mean there weren’t a lot of important considerations when it came time to plan the second book. Rather than developing each individual character, I decided it would be best to focus on their relationships. Of course, the relationship between Shima and Erica was always meant to be the central focus of the story. At its heart, Eternity’s Empire is about two young women who fall in love and determine to spend their lives together, despite the overwhelming odds against them. I modeled this on the early portion of Serenity and Endymion’s relationship in Sailor Moon. Neither of their kingdoms ultimately wanted them to be together, but they didn’t allow that to stop them from following their hearts. The key to depicting Shima and Erica’s relationship, and subsequently Gaea’s connection with Aeternitas, was how it manifested itself through the various ages of their reincarnation. I wanted to show that the two of them were inexorably drawn to each other no matter the circumstances of their birth or the distance separating them. Which allowed me to create several vastly different scenarios to play with. Though I had to be careful, because the time I got to spend with each was limited. A lot of characters means a lot of relationships to manage. But while Shima /Gaea and Erica / Aeternitas take center stage in this story, their relationship isn’t the only important one. The relationship between Aeternitas and her guardians also features prominently in this series of chapters. I wanted to give everyone a glimpse of why this connection is so strong. And why the guardians remain devoted to their charge no matter the circumstances. As the story progresses, I also have more opportunities to explore the relationship between Gaea and her guardians, which is vastly different in comparison. While Aeternitas has formed a formal and official bond with her guardians, Gaea’s guardians have chosen to impose the role on themselves. Which means that the interactions between Gaea’s guardians and Aeternitas’s guardians also begins to play a larger role in the story. These are some of my favorite interactions to write. Especially since some of the guardians have a history (such as Thora and Skadi), while others have never met before their encounter on Earth. I have tried, wherever possible, to focus on healthy and supportive relationships. I want my work to illustrate how important it is to have that kind of support and stability amidst the chaos of life. But unfortunately, not every relationship is healthy or supportive, and I have not gone out of my way to exclude those relationships from my work. First, because it’s important to acknowledge that all kinds of relationships exist, and some people deal with these hardships on a day to day basis. But mostly because the juxtaposition reinforces how important healthy and supportive relationships can be. Striking a diverse balance with a large cast. I promised to reveal more concept art, so here we go! As I mentioned before, I rendered all of these initial concepts using various doll makers online (at the suggestion of a good friend). It really helped me get a handle on each of the characters before I started writing them. Though I do think I worried a bit too much about their outfits (which ended up being less important than I initially thought). The second set of character concepts was more difficult than the first because I didn’t want any two characters bearing too close a resemblance to each other. It was quite a challenge to sort everyone out, and I had to revisit several concepts to get the balance just right. For instance, I gave Aeternitas’s original hairstyle to Skadi because I thought it suited her better! Nuit and Skadi were easiest, in part because I was already familiar with the mythology surrounding both goddesses. It also helped that I didn’t have any other Egyptian goddesses floating around. So I hadn’t used any of the concepts I wanted to reserve for Nuit. 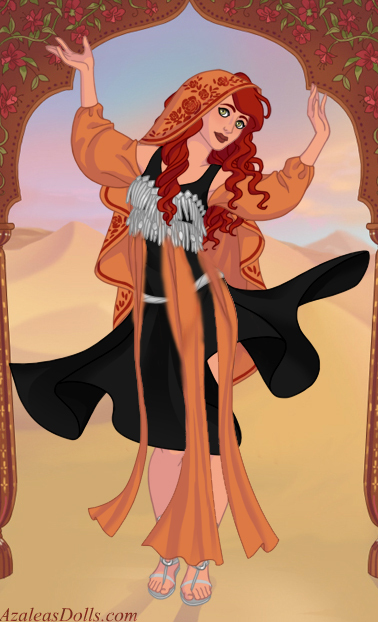 She ended up as a sort of Egyptian style sorceress. Meanwhile, it took some effort to balance Skadi and Thora. Their concepts are similar but I wanted each to feel unique. For Thora I settled on a warrior theme. So I decided to make Skadi look more like a hunter. Reaching deep for the finish. Muerte and Chronos were much more difficult. First because I had to do a lot of research on Muerte’s mythology. Second because I had already used most of the popular Greek aesthetic on Aphrodite. I admit to drawing a lot of my inspiration for Muerte from the Book of Life movie’s depiction of her. But I also tried to ground it heavily in articles I read about her cult in Mexico. Though it was impossible to get a skull in a doll maker, I’m pretty happy with how her concepts turned out. Chronos involved a lot of fooling around until I was satisfied she was sufficiently different, if I’m honest. Though my real breakthrough with her came when I decided that use of her power would sometimes cause her to age. 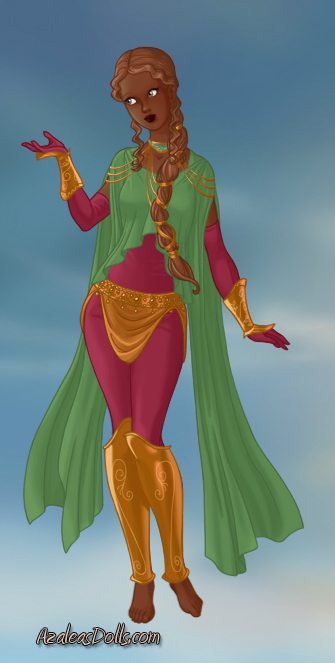 Compared to all the other concept designs, Gaea was, perhaps, the easiest. 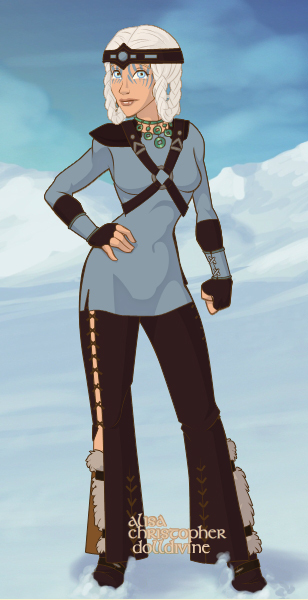 Though she was one of the last characters I designed, I had already decided how I wanted her to look. I embraced the earthen aesthetic for her. 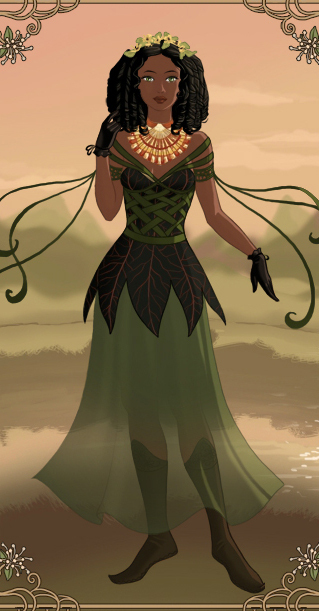 I imaged her dressed in green leaves and flower blossoms, with ribbons and shells to decorate her outfits. In fact, of all the character pictures, hers strikes closest to my original vision. That’s it for this glimpse into my notebook. Though I hope you’ll join me next month for the unveiling of book three! Pick up your copy of the paperback today! 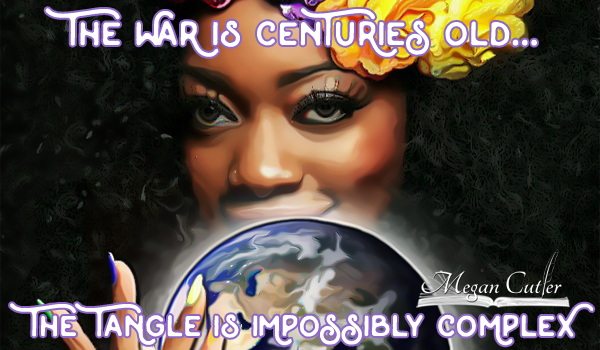 Shima Watson thought she was an innocent bystander caught in a power struggle beyond her ability to influence. Until the awakening of her dormant powers triggered a series of latent memories. Now the guardians of Aeternitas know the truth. But the truth can’t reverse the damage. Poised on the brink of war, the guardians of Aeternitas must now work with the same people who hunted them mere hours before. But the alliance is tenuous at best. And it seems not all their former enemies are interested in working together. Time is running out; but if the threat of war can’t unite them, what else can?